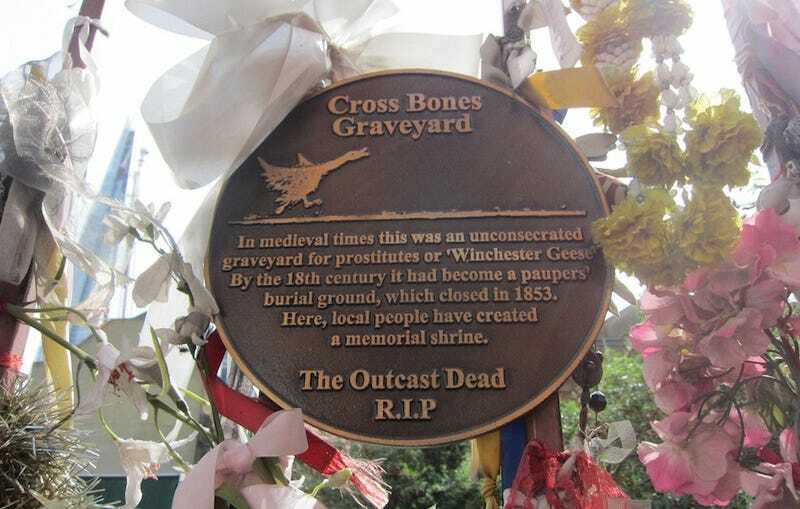 Visit This Neglected Medieval Cemetery for the "Outcast Dead"
London's Cross Bones Graveyard dates back to the medieval era, and is the final resting place for some 15,000 paupers, prostitutes, and other "outcasts," including children and infants. Despite a colorfully decorated gate, the run-down lot hasn't been accessible to the public. That's about to change. There's been a recent approval of plans to install a three-year, temporary memorial garden on the site. The Bankside Open Spaces Trust made an announcement at the end of 2014 that permission to build a temporary garden was granted from the Southwark Council at the Cross Bones Graveyard site. The agreement includes a three-year lease from Transport for London which owns the property and has had its eye on developing it in the heavily commercial area of London. Some preliminary work was actually initiated last summer, as London SE1 reported in August, including the relocation of the metal gates that with knotted ribbons and entwined plastic flowers have become a public memorial. Much of the attention to the graveyard has been spurred by the Friends of Cross Bones and particularly writer John Constable, with their vigils held every 23rd of the month encouraging attention to the site. Much of this has centered on the women believed to have worked in 16th-century Southwark brothels. A plaque installed at the site for the "Outcast Dead," adorned with a bird representing the "Winchester goose," a nickname for the prostitutes, states that it "was an unconsecrated graveyard for prostitutes" in medieval times before becoming a burying ground for the indigent in the 18th century. London SE1 adds, "Work will begin this winter, with public access for volunteering expected from spring. BOST plans to work closely with Friends of Cross Bones, and to make safe as much of the structure as possible that is already there, while dealing respectfully with the large number of human remains on site." Photos by Allison C. Meier via Atlas Obscura.